Community cinema is a wonderful and often powerful thing. It’s a source of collective community spirit, and a place for memories to be explored, recalled and created. We started Screen25 in order to bring cinema to an area that had been deprived of it for over 45 years, and through our recent growth and expansion, we’re please to say that we’re well on our way to being a permanent and full-time addition to the South Norwood community. We’ve blossomed from humble beginnings and tough times to become what is now a twice-weekly cinema, open every Wednesday and Friday evening, alongside our regular Family Film Club, Bring Along Baby screenings, and unique special events. We’ve also now have a licensed pop-up café bar, and high quality 4K projection, all possible because of the support we’ve received from our local community. South London is currently going through an exciting growth, something that can particularly be seen in the impending opening of two cinemas not too far away from us. But whilst it is exciting to see big chains coming to an area, it is more important than ever to celebrate and support those smaller independent organisations that are already there, built from the ground up through sheer determination and love for their communities. Sustainability is something we’ve been looking into a lot recently. We’ve re-vamped our membership options, which is never an easy task. But we constantly remind ourselves that we are a community cinema, run by the community and enjoyed by the community. This is why our loyalty scheme is so important to keeping this community project alive. We could go into the many benefits of our loyalty scheme, from the unlimited access to film, to discounts and goody bags, but the real reason to join the loyalty scheme is the support you can provide to your community by keeping us alive. Running a cinema involves costs, from film licensing to venue hire to paying our staff for their hard work. And even if unlimited cinema isn’t for you, please remember that your patronage helps us to keep our doors open and be more adventurous with the films we programme and the people we partner with. Joining the scheme is a way for you to say you care about film, community, art, culture, collaboration, and togetherness. It’s a way of supporting accessibility and the sharing of knowledge and education. It’s a way of ensuring that your hometown is more than a rest stop but a place to enjoy and spend time in. Join the loyalty scheme today for just £15 a month and reap a huge range of benefits including unlimited access to film (equal to less than £2 per film! ), free gifts, discounts in our pop-up café bar and on tickets for special events, plus exclusive reductions for accompanying friends. But also for the benefit of supporting a community project and being part of the community you call home. What are you waiting for? 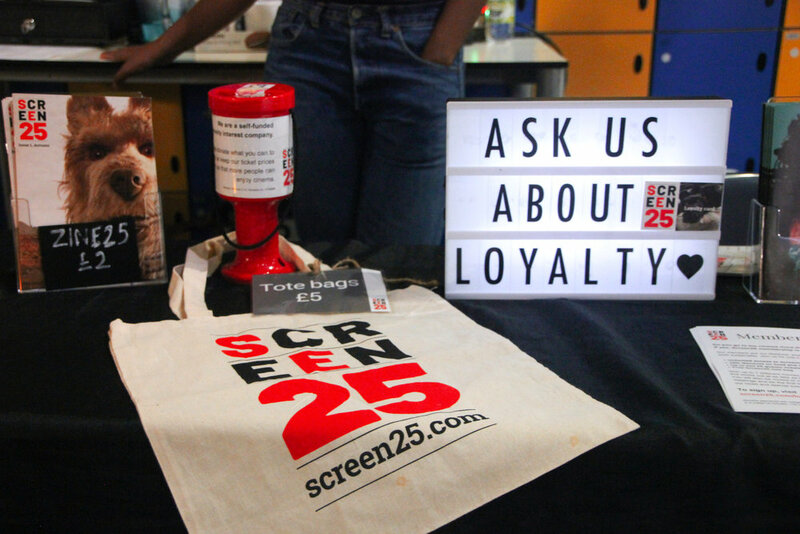 Join the Screen25 family today. Take a look at our upcoming programme to see the wide range of films you could have unlimited access to.